Loss in war is a universal notion. It can be experienced differently based on the location, the conflict, and the circumstances of death, but the mourning process that families go through when they learn that a loved one has been killed in action can occur in any place. The pride of serving one’s nation is also a strong factor that often plays into both a soldier’s drive to enlist and the comfort a family might feel after learning of their sacrifice. 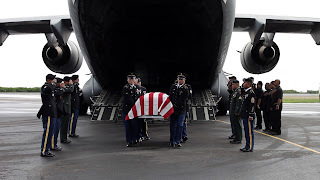 When serving a nation that doesn’t quite recognize you as a citizen, that sentiment because complicated and can lead to even more difficulty coping with a death or a traumatic experience in combat. The Federated States of Micronesia, a grouping of over six hundred islands in the Western Pacific Ocean, became a United States territory at the end of World War II and an independent nation decades later. Its affiliation with the United States permits its citizens to serve in its Armed Forces, and the great discrepancy in wealth – the starting salary in the army is nine times the average annual income in Micronesia – have led to a large number of Micronesians enlisting, despite a distinct lack of services, including both emotional and financial support, for those who return home and for the families of those who do not. This film centers on a few families in the Micronesian state of Kosrae, covering the difficulty of returning for those who served in Afghanistan alongside other Americans and the devastation of a family whose son never made it home. The distance they travel to go fight in war is felt most in the relationship that they have with the United States from afar, unable to benefit from financial subsidies of healthcare costs or even to have any access to veterans’ affairs’ services on the island. The notion that, as expressed by one mother, “we don’t vote, but we can serve and get killed” is deeply felt by those interviewed in this film, which also surveys the aspiration of the reality that this nation was set up to eventually sustain itself, with United States aid ending in less than a decade. The symbolism of having no voice is conveyed powerfully when a man goes to ask a question in an informational session only to find that the microphone has been turned off and no one even knows he is trying to speak. This film serves as a tribute to those whose service and sacrifice it portrays, and an unanswered challenge to the complexity of this nation’s situation.